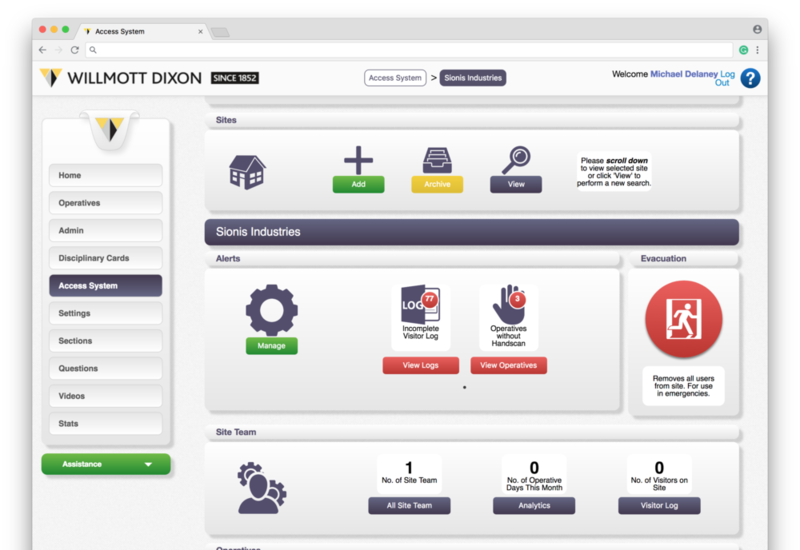 The construction industry-proven online induction solution. Replacing Willmott Dixon's former site inductions, Pre Enrolment has been rolled out across all of their sites since January 2015. It is used by over 165,000 of their people and supply chain labour to ensure they are ready for work on site. 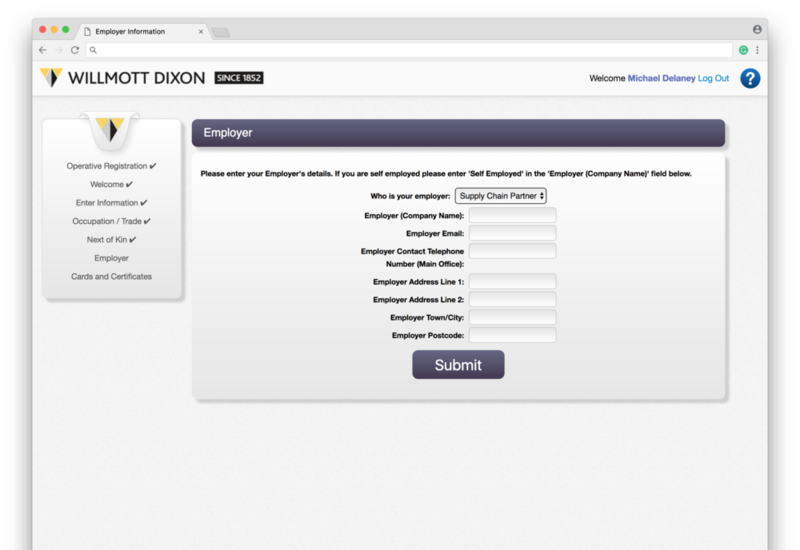 This is the page all workers will see when they arrive on Willmott Dixon’s Pre Enrolment web application. A video embedded on the webpage provides an overview of the induction process. Workers access and re-access their profiles by entering their information on this page. There are options to select which type of skills card is being used. These can be cross-referenced with the CITB database. Once a worker has entered their data, they are presented with instruction on how their information will be processed. Workers enter their own personal information. This data is collected for health and safety purposes, as well as for the reporting on site KPIs. The worker can select their occupation and trade from two drop down menus. The first holds a list of the most common onsite trades. The second dropdown holds over 1000+ different job roles. The worker can start typing their occupation as listed on their skills card and select it from the menu. The occupation and trades selected by the worker will determine what content they view later in the induction. This page also collects more information about the worker’s employment history for KPI reporting. Workers may also provide Next of Kin information. This can be used as contact information in the event of an emergency. Workers select whether they work directly for Willmott Dixon, self employed or as part of the supply chain. Employees from Willmott Dixon will also be asked to select which Local Company Office they work for. 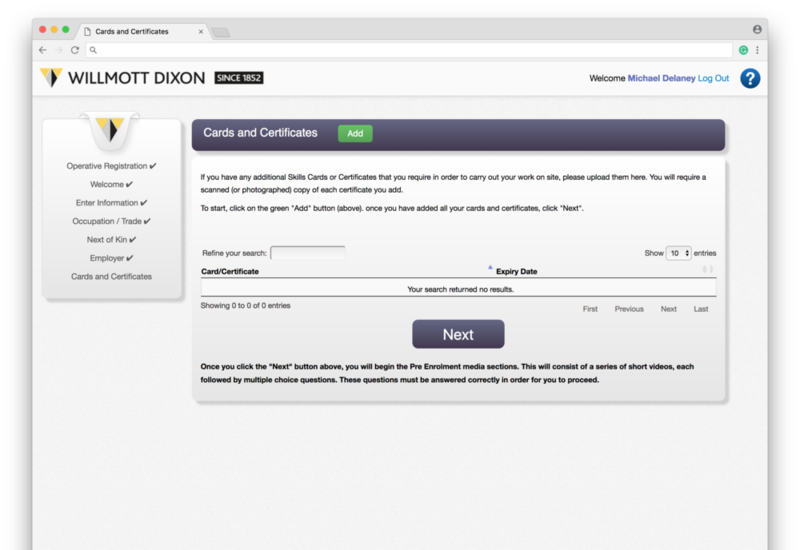 Any additional qualifications or certificates can be securely stored on the workers profile. Selecting ‘Add’, they can enter basic information about the qualification and upload a photo as proof of competency. 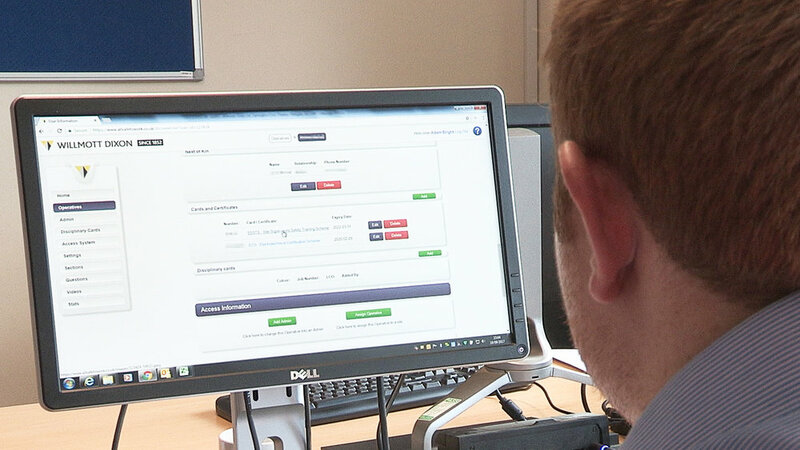 Once the worker has completed the data entry sections, they will then sit the relevant sections for their role onsite. After each video, the worker will be asked to answer two multiple choice questions based on the content of the preceding video. If the worker answers either question incorrectly, they will be required to re-watch the video and answer two different multiple choice questions on the content of the video. Once the worker has successfully completed all sections, they will be presented with the congratulations screen. 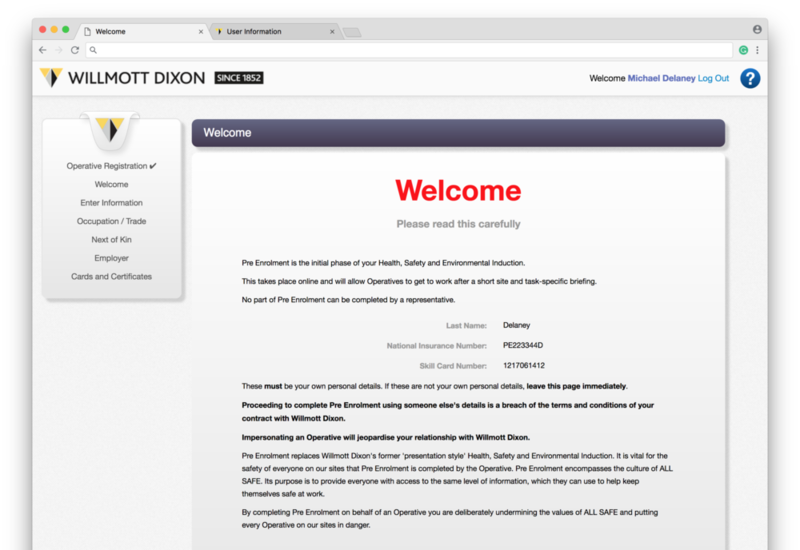 This screen also contains a link to some of Willmott Dixon’s other helpful resources that can be used onsite. 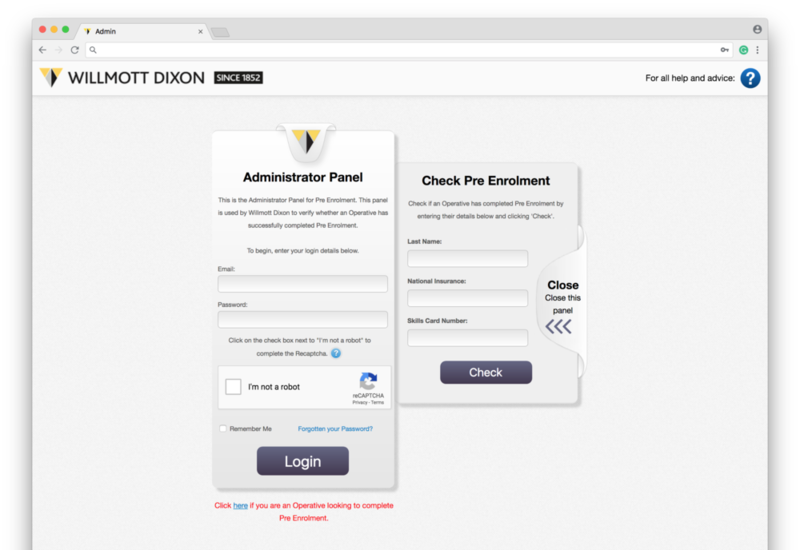 Administrators for Willmott Dixon, such as site team members, login to the Administrator panel. There is also a quick ‘Check Pre Enrolment’ feature that allows individuals to check the validity of an induction. From here, a member of the site team can navigate around the administrator panel. An administrator can locate an individual’s profile through the Operative Search. 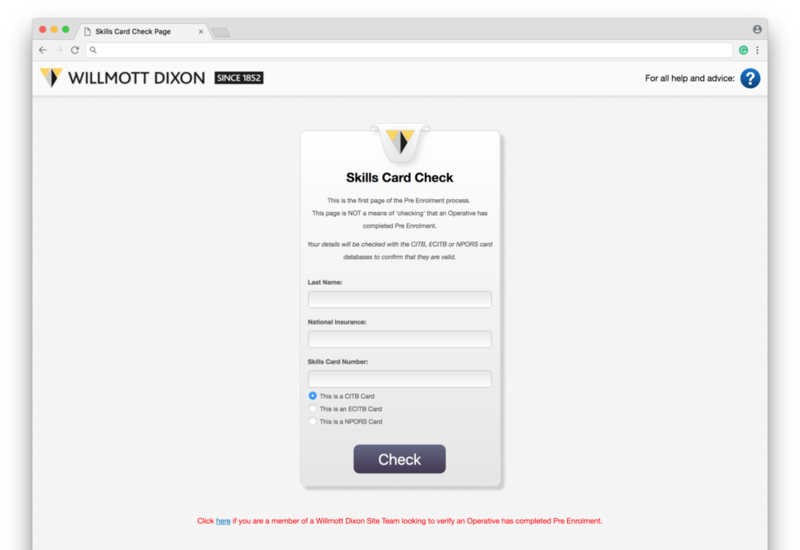 Using any piece of unique information, such as a Skills Card Number, the administrator can search for a worker. 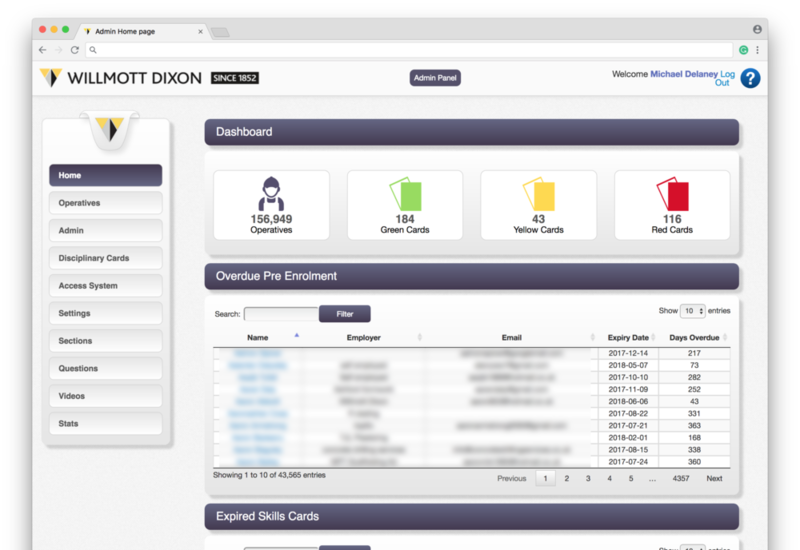 An administrator can view all the relevant information of a worker from their profile. This includes any relevant personal and employer information, as well as information relating to Willmott Dixon’s access system. The administrator can also view and manage their sites access system from the panel. From here they can manage and monitor the movement of operatives and access reports for KPIs. "Without doubt, this solution has been the most successful and beneficial IT project we have ever embarked on." How Pre Enrolment was developed. 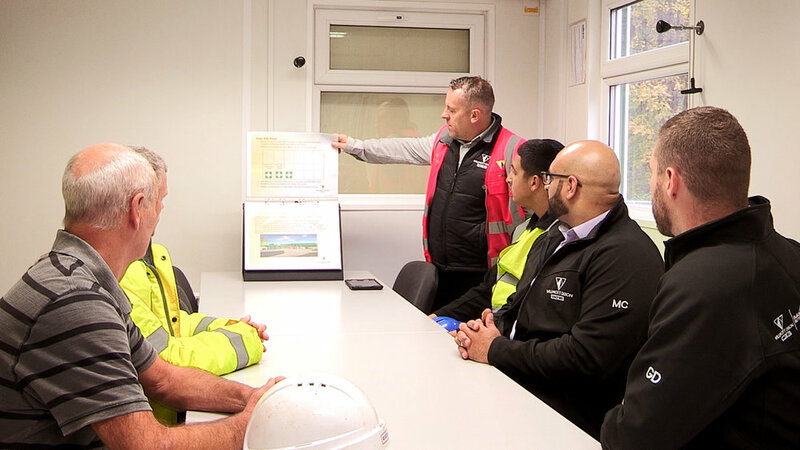 The All Safe culture, which helps to embody Willmott Dixon's Health and Safety best practice, is at the forefront of the company's day-to-day operations. For many working on a Willmott Dixon site, the mandatory health and safety site induction is their first experience of this culture. In 2014, Willmott Dixon approached Colonel Duck Productions to help improve the on site induction process. At the time, presentations were delivered by members of the site team (sometimes more than once a day). In order to ensure that the information given to workers on site was consistent, the idea of creating a series of induction videos was proposed. Working together with Willmott Dixon's health and safety team, we helped to breakdown and evaluate the on site process. In addition to the health and safety presentation, which was delivered to every new starter on the site, workers were also required to fill in a significant amount of paperwork as part of the induction. This requirement for a worker to complete paperwork, as well as sit through a health and safety induction, is common practice across the construction sector. It was here that an opportunity to develop a industry-changing solution was identified. Building on the initial objective of creating a series of engaging health and safety videos, the opportunity to improve the experience even further, and save time for all on site, was seized upon. Thus began the creation of a web application where all workers on site could securely enter their details, as well as view all of the health, safety and environmental information they would require on site. This application was called 'Pre Enrolment'. First trialled across the West Midland's region, the application was used by workers and site teams. Feedback was collected and used to iterate and improve the solution. 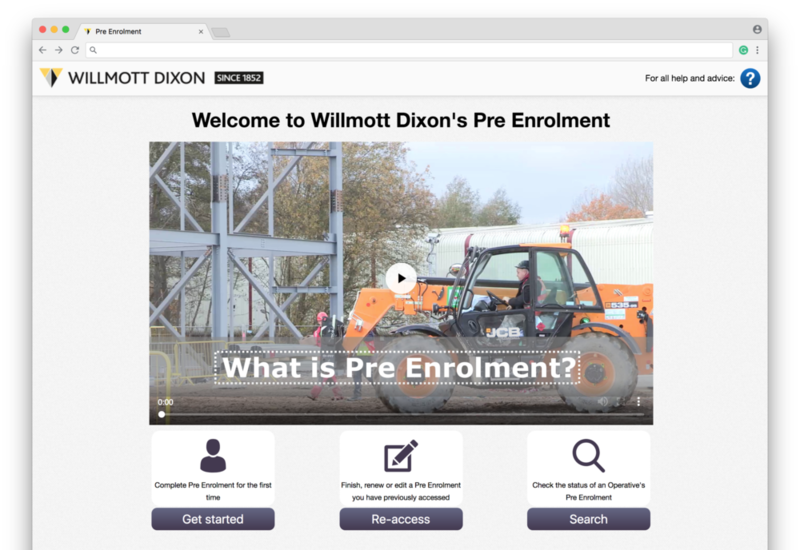 Willmott Dixon's Pre Enrolment system created a database of all personnel working on every site across the country. With this foundation, we continued to work with Willmott Dixon to realise the potential of their induction solution. 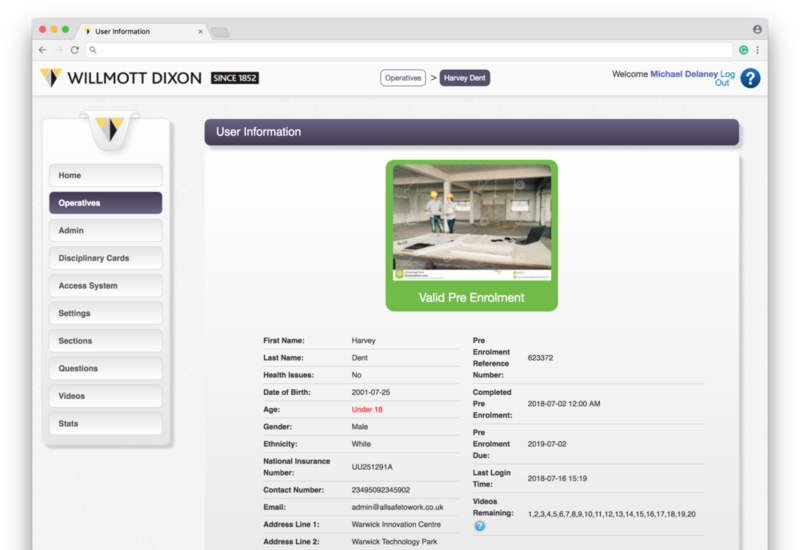 Combining this information with sign-in and sign-out information, collected through biometric turnstiles, would provide Willmott Dixon with a live picture of the operations across all of their sites. As a consequence, Pre Enrolment was evolved into an Access System: the Pre Enrolment Access System (PEAS). PEAS helps to make sites even safer by only allowing those with a valid Pre Enrolment onto site. It also saves more time for site teams, helping to collate information for KPIs and displaying them in a useful format for reporting.